Weird, noisy, distorted, mind blowing. They would be good words to describe the album. Although there are people for sure who can’t stand this kind of music, I love it. The first tune “Sammalkorva” has cleverly used drums and effects that get to your head and eat your brain, ahem. No melodies here, who needs ’em anyway? The second track “hieno ihminen” consists mainly of weird drumsequences (heavily flanged at times and effected, of course) and feedback noise on the background. Kyllönen must have heard R.D.James’ Vaz Deferenz a little too many times ’cause the background beat sounds just like it. There are even some bits of melody in this one in the end part: some random sounding little bleeps. Third track, “retrospektro”, is again something weird (all of them are actually). 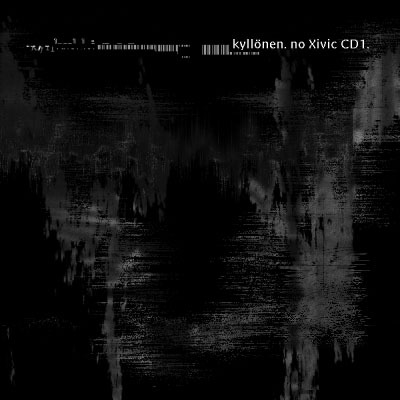 If this was commercial music it Kyllönen would probably get sued because of this track’s sampled musical bits (Ettei vaan olisi Abbalta?). At times the beat vanishes in the chaos of distortion and noise – this was almost hard listening even for me but I guess I’ll survive from the ear damage. “Kehoruoska (kolmas muoto)” has the same wicked formula. This one also has some strings (whoa!) playing little one note tunes. This track probably has the least to give because of its minimality, although this has some good ideas too. When I listened this I began to feel uncertain about my speakers when the track came towards the end. This album is really something that you shouldn’t recommend to someone who has a narrow mind in music or who listens only “musical” and mainstream music. A high quality professional album this one. I say brilliant – can’t wait for CD2.